The area around the present-day Church of the Redeemer came into the possession of Prussia in 1869. Initially it was decided to reconstruct the Crusader-period Church of St. Maria Latina (12th century AD) that was still preserved in ruins. As a result of excavations and investigations at the site it was, however, decided that a new building would be more feasible - the present Church of the Redeemer. Conrad Schick, an architect and the most famous archaeologist living in Jerusalem in this time, found under the name of St. Maria Latina a wall that he interpreted as the city wall from the time of Herod the Great (37-4 BC). It was on this that the foundation stone was set on behalf of the German Kaiser in 1893. The Church of the Redeemer was built in the years 1893 to 1898 according to plans by Friedrich Adler. It lay exactly two meters above her predecessor from the Crusader period. The Lutheran Church of the Redeemer in Jerusalem was inaugurated on Reformation Day 1898, in the presence of Kaiser Wilhelm II. 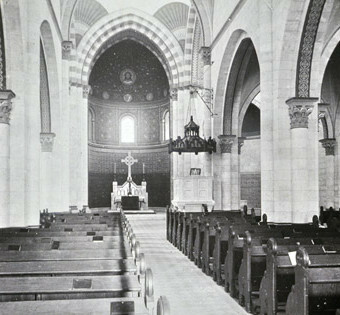 The Romanesque Revival-style church is today the center of the German, Arabic-speaking and other Protestant churches of Jerusalem. The present appearance of the church dates to the renovation in the years 1970-1974. The medallion and the glass windows in the main apse impart an impression of the church’s former character.